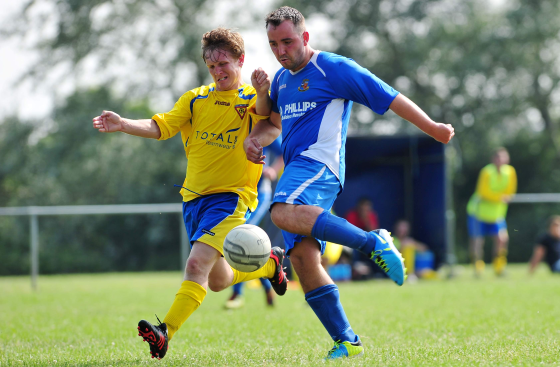 Are you looking to earn cash and other rewards for your beloved grassroots team? Fear not, My Club Betting can help (18+). My Club Betting provide free websites to over-18s teams. In turn, these sites provide teams with free sports equipment and an extra revenue source. Are you an administrator of an existing Club Website team? 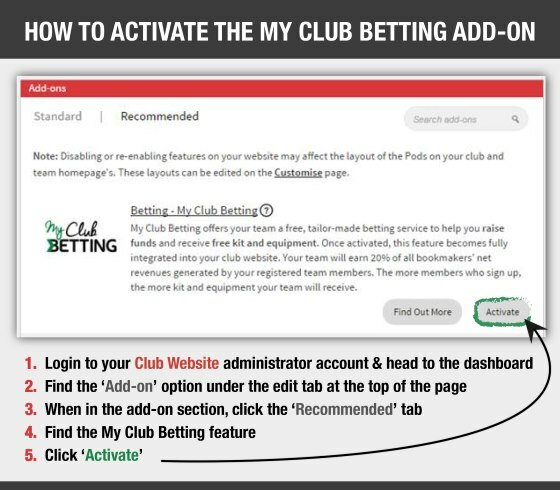 All you need to do is take a few moments to activate the My Club Betting add-on. Simply click the button below to find out how (instructions open in a new window). Along with this, 20% of all revenue created on the site goes straight back to the club*. Social media is vital these days. My Club Betting promote your betting site using various social media channels, and provide assistance whenever it is required. They also supply teams with free marketing materials. These clubhouse-friendly items can help drive interest towards your betting site and include bespoke business cards, beer mats and posters. Do your club supporters like a bit of insight before they bet? Not a problem. My Club Betting provide your supporters with expert advice and opinion from respected, award-winning sports betting journalists, available via weekly emails and blogs. Along with this, their social media team construct weekly tweet schedules, personalised for your club - with the intention of getting people to use your site! My Club Betting are doing their utmost to ensure that grassroots clubs are earning revenue. The service they provide is gathering pace, with over 75 sports clubs signing-up on a weekly basis. It is also worth noting that well over 90 percent of all teams using a My Club Betting service are currently earning steady revenue. Don’t forget, it is not just football clubs who can benefit from a My Club Betting service. Recently teams from within basketball, rugby, golf, cricket, shinty and even footgolf have signed up to the service. Northern League club Sunderland RCA are one of the biggest teams within the My Club Betting stable. Club Secretary Colin Wilson is a big supporter of the service and believes it should be recognised as a safe and normal way of fundraising. Wilson makes a very valid point – which is why so many people are jumping ship from their current bookmakers. Don’t get left behind, sign up to a risk-free service and help grow your club by attracting users to your own team betting site. Bet in confidence knowing that you are helping to fund your own team rather than totally funding the bookmaker! To find out more, call 01883 772929 in office hours, or visit MyClubBetting.com. * T&Cs apply.